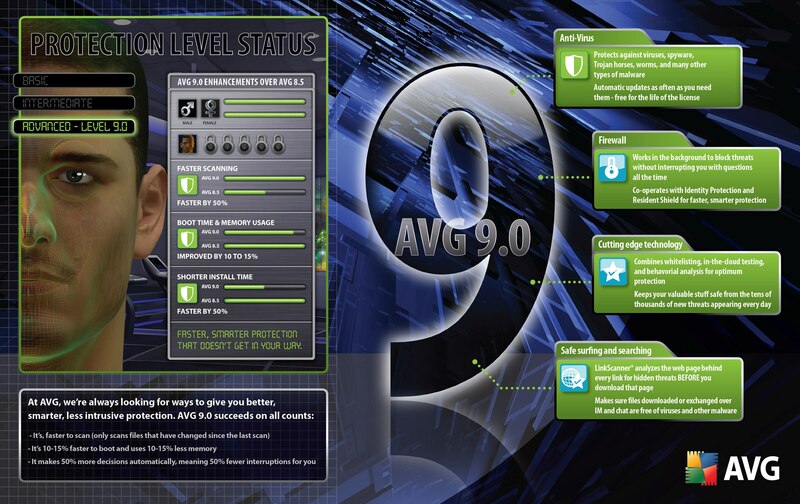 AVG has released the new version called AVG 9 Free. AVG Anti-Virus Free Edition 9.0 is compatible with the major Windows OS’s (Windows XP, Windows Vista and Windows 7). It not only features an antivirus module but also modules for detecting spyware, basic rootkit protection, email and phishing protection as well as the AVG Linkscanner to give safety ratings for websites. Windows users who do not need all the components, should select the custom installation option which allows them to select which modules to install and prevent installation of optional modules like link scanner, AVG security toolbar and email or Microsoft Office plugins. The main interface is very clean and straightforward. It displays the available security components in an overview upon AVG 9 startup. In this display, you will get the usual options to do scans, schedule scans, update the antivirus software. You will fine all the advance settings in the advanced options. The scan speed has been increased and the resource usage lowered according to the developers at AVG. You can download AVG 9 Free at the AVG website. Update: You can view two nice graphics and a video related to the new AVG 9 avatar! The version 8.5 was a bunch of crap. It made the whole system a lot slower. The linkscanner crap, also makes web browsing a pain! Every link is checked by Internet Explorer antiphishing crap, and AVG linkscanner, making web browsing a horrible experience. If version 9.0 did not improve in performance and memory footprint, then it would not be worth installing. If you want to go for AVG, then you have to first uninstall Norton from your PC. To remove Norton, click on the Start button, then click on Control Panel and double-click on Add or Remove Programs. Search for Norton and then click on Remove. After removal, restart your computer. Now, download AVG using the link given in this article and install it. what problem are you facing when trying to download avg? For anybody using Norton I highly recommend ditching it and installing AVG, it is so much more effective!